As a side-effect, because the story can’t give away the ending, it frequently gave me a partial view, blanking out obvious things that the viewpoint character could see and was thinking about. Now, I’m not an expert in the mystery genre. As I recall, the mysteries I’ve read have achieved this effect simply by staying in the mind of the detective. Suspense novels, not so much, but in a suspense, it’s more important to maintain the tension between hero and villain, rather than to keep secret who the villain is. I’m not sure I liked the effect in Taxed to Death. The story did get better near the end, as the situation became clear and the forces of evil began to close around our heroes. Even so, I never understood why Alex and Jillian did most of what they did, or felt what they felt, or thought what they were thinking. This is extremely important to me, because rich, three-dimensional characters are key to a good story. And these characters just fell flat. This story is also missing a theme, as far as I can tell. I had originally expected something like: financial fraud is about more than money. (And that could be the theme of the story… maybe, kinda.) Or: we all pay when someone embezzles funds. (And I didn’t get that at all from this story.) Much less did I see an uplifting, character-based theme. It simply wasn’t that kind of book. After all of that, I do hope to read the next book in the series Fatal Encryption. Why? 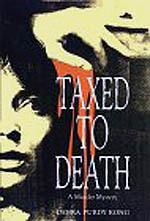 Well, Taxed to Death is Debra Purdy Kong’s first book, published 15 years ago. That means that Debra probably put more into it than any other story she’s written, but also that it reflects her inexperience as an novelist. I’m hoping that Fatal Encryption, which came out just a couple years ago, gave her a chance to address some of the storytelling issues I noticed in Taxed to Death. Most importantly, I’m hoping she has gotten better at characterizing her characters, and I really want to get to know Alex Bellamy.